Meet Tyran, our fast-paced Installation Engineer all the way from Australia. Tyran is not shy when it comes to Air Conditioning Installation. With his specialist expertise being HVAC installation, Tyran is very confident when it comes to back to back splits! 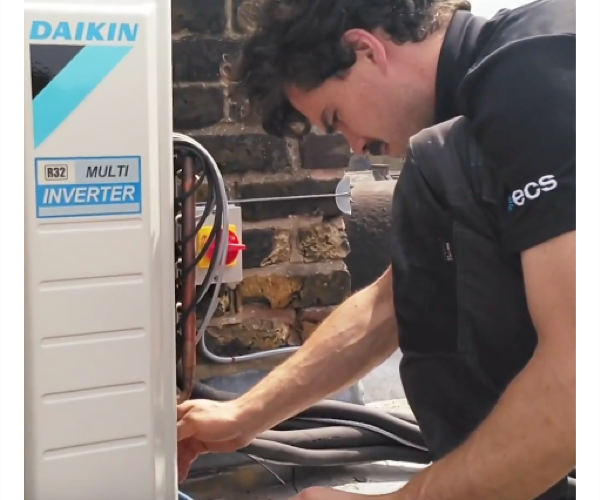 When the London weather heats up through the Summer months, we put his expertise to the test, keeping him on his toes with non-stop Residential Air Conditioning Installations. Working as part of a two man team, with his mate on hand to assist, Tyran installs Mitsubishi Heavy Industries and Daikin multi-room and split systems from start to finish. His precision is key, from brazing to electrical work, fitting condensate pumps or running overflow drains – he can do it all! As with all of our F-gas qualified lead engineers, it’s not just braun that they display, they have the brains too. Responsible for technical fault finding and commissioning, our engineers are all round Air Conditioning Contractors. As an installation engineer, Tyran can get a wall mounted split system installed in less than 4 hours. Want to put it to the test? Give us a call today.